I just got to 99,000 and figured I would share with the class Haha. For the year if the car would that mileage be considered low? I think so and congrats! My wife finds me weird....when the LS hit 100k last year, I had to take some pics, and not with my cell, but with my DSLR! What this tells me is I have picked up a lot of habits from my parents. I remember them doing this, well not pics, but celebrating 100k on various cars by making a note of it while in the car. Then you go on my Maxima forum and people post 300k all day long like it's nothing, and one guy 479k.....I truly hope everyone here sees 300k, I think there are some already! edit 2 nevermind, in some other pics mine does look like that--never noticed! Last edited by Johnhav430; 07-18-18 at 05:40 AM. Congrats... and yes, she's still a baby. An 05, being 14 years old should have over 150k miles on it. You've got some catching up to do. Thanks guys and yah I am keeping this car so I want to see how far I can get the mileage up =). It'll be a few years before I get close to that milestone. Keep enjoying it in good health! 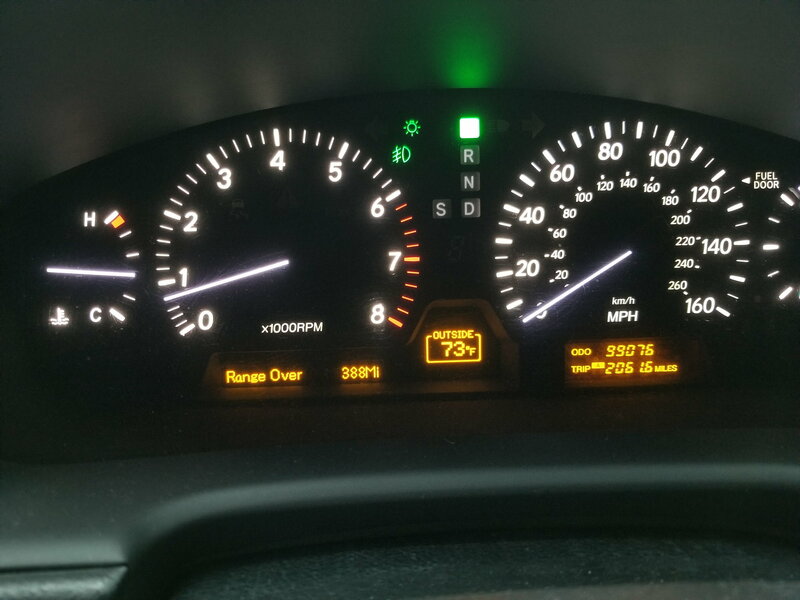 My '05 just turned 126k and I consider being on the lower end of the mileage. Used to be that normal mileage was 10k a year, now I think it's 12k a year. Even at 10k you should be in the 130k range.....so, yes, your's would definitely be considered low mileage. I'm always on the fence of handing my LS430 over to my middle son next year when he starts driving and going out to find me a '13-'14 LS460. However, I still really like the car and it runs great. I'm partially afraid I might be a little disappointed going to a LS460 once the newness wears off. My other option is to keep it and go find a decent GS for around $6k like I did my first son. I had to do a couple minor things to get his GS up to my standards but now his car is running every bit as good as mine with 171k miles. Those are great cars as well but for me I wouldn't trade my LS for one. So, I might keep driving mine for at least a few more years. Last edited by caverman; 07-18-18 at 09:09 AM. I like to think that I am the 3rd and final owner to my LS430....I haven't opened it in a while but I have a spreadsheet to see what % of its life it belonged to each owner lol meaning 1st was 8 years, 2nd was 2 yrs, now I am almost 2 years. This is all fantasy. We have a single car garage, and it's a "ritual" for me to pull my BMW garage queen out. You fellas with the 3 car garages or huge driveways don't know how great you have it!! I have a 3 car garage and really need a 4th. There are some houses not far from me that have 6 car garages and more than you would think with 4 car garages. The wife's car is in the garage but my Lexus sits outside along with my son's GS. In another year my middle son will be driving and another car will be sitting outside as well. I could fill a 6 car garage pretty easy. I have a 3 car, but would love to have a 6 car. Looked at a house a few years ago that had 6, but didn't want to pay up... now I wish I had. I thought, before I bought my first LS that I wanted a GS... but after I had the first LS, there was no looking back. haha grass is always greener I guess. I just feel "restricted" that I have to consider the time it will take to get my BMW out of the garage, and if I have enough time, to get to work, before I take it out. It's a manual garage door at that, and I rekey'd the lock myself when I lost the house keys! So I would like one of them 3 car garages with the fancy electric openers!! p.s. working on the car is a pita--I just leave the possibility of the car not being driveable, so I have to move the car not being worked on to the street just in case. 2003 LS430 - Remove Dipstick to Remove Valve Cover?